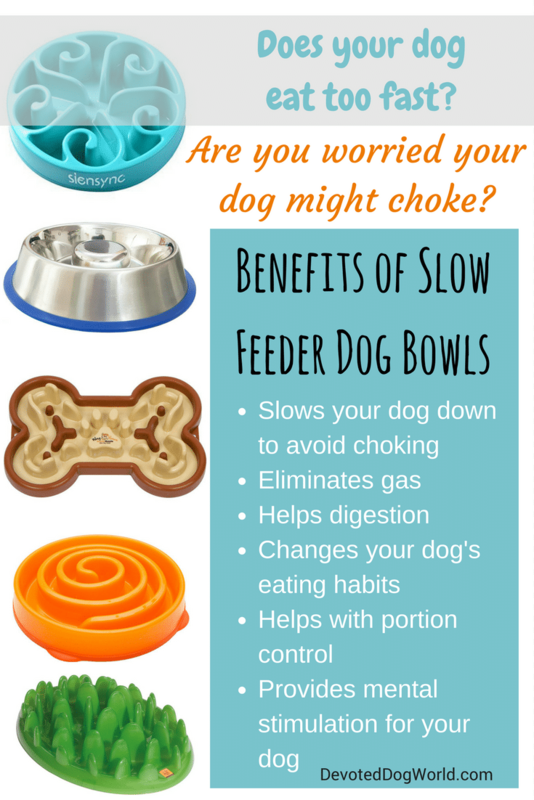 A slow feeder bowl can eliminate a lot of concerns with your dog. If you haven’t tried one yet, you really should. They’re not expensive but they can make a huge difference for your dog. And best of all, a slow feeder dog bowl could remove a lot of worry for you as a dog parent. For a small price, you get peace of mind and your dog gets improved digestion. A slow feeder bowl creates separations or obstructions in the food. This modifies your dog’s eating behavior and forces him or her to slow down their eating. By slowing down, your dog is less susceptible to bloating and it improves their digestion of the food. So, how do you know whether your dog would benefit from using a slow feeder dog bowl? These types of dog bowls come in different shapes and different materials (and of course, different colors!). To find the best slow feed dog bowl, take a look below and decide on your preferences. If you like stainless steel, you can get a slow feeder option in stainless. If you like a spiral shape because you’ve got a friend who’s had success with one, then there are plenty of spirals to choose from. There are lots of details here to help you choose what’s best for your dog. Large dogs in particular tend to gulp their food very fast. Of course, this can happen with smaller dog breeds too. It really depends on the personality and background of the dog. No matter the size of your dog, you might be in the market to find the best slow feeder dog bowl to suit your dog. I used to watch my dog eat dry food at such a fast rate I was concerned he might choke on the food he wasn’t chewing properly. It was quite frightening how fast he would inhale it. It was only a matter of seconds and he’d have polished off an entire bowl. If you’re concerned about this with your dog, you should definitely try a slow feeder dog bowl. It’s made a world of difference in our household. To find the best slow feed dog bowl, is to find peace of mind as a dog parent. Not only does a slow feed dog bowl slow your dog down but it gives them time to actually chew the food before swallowing it. A slow feeder bowl can give you peace of mind if you have choking concerns. To avoid choking take a look at the best slow feeder dog bowl for your size of dog and breed. For the small price of a slow feeder you can buy your dog better health. When a dog eats super fast this encourages bloating. If you’ve ever needed to take a dog for emergency bloat surgery, you’ll know how scary it can be. Find the best slow feeder dog bowl for your dog now to save your dog from painful bloating or digestion trouble. If your dog is suffering from gas (or maybe you’re the one doing the suffering) it could be because of his or her eating habits. It’s worth finding the best slow feeder dog bowl that suits your dog because as soon as you slow down that eating, you’ll probably slow down the bloating. If a slow feeder doesn’t work, of course, visit your veterinarian to get answers. My dog could eat his food in about 20 seconds in an ordinary bowl. It was ridiculously fast. After we switched to a slow feeder bowl he took about 10 minutes. And it’s much more peaceful. There’s no more gulping. It’s worth it to find the best slow feed dog bowl for your dog. Slow feeders are available in Stainless Steel and they’re still affordable. A couple times my dog ate so fast he vomited afterwards. The vet suggested slowing down eating and a friend of mine highly recommended slow feeder bowls. This is when I started my research to find the best slow feeder dog bowl. If your dog inhales his or her food, you know it’s not digesting properly. By slowing down the eating process and encouraging your dog to chew the food your dog will absorb more nutrients from the food. Most dog parents are now aware of giving their dog healthy food. But you want your dog to actually digest the food properly to get good benefits from it, they need to slow down their eating. Gobbling food fast really doesn’t benefit anyone. It’s time to find the best slow feed dog bowl for your fur baby. For the small price, you can get more than one slow feeder. Different bowls keep it interesting for your dog. If you adopted your dog from a rescue shelter, you probably don’t know a lot about their background. Bad eating habits may have been encouraged. And there’s a high chance that your rescue dog was not given adequate food in the past so they were often starving and desperate for food when they got it. This would mean they’ve learnt to eat as fast as possible so they don’t miss out. It’s hard to change a dog’s eating habits. They don’t respond to commands when it comes to eating! But you can make changes easily with a slow feeder dog bowl. This type of bowl is an easy way to change your dog’s eating habits without you needing to do anything. When my dog used to wolf down the food it was hard for me to resist giving him more. He would look at me with those eyes and make me feel guilty that he was still hungry. Even if I didn’t give him more, I’d give him more treats and bits of my own food to try and compensate. The problem with this, is that your dog will put on weight. If you are facing the same problem with your dog, I recommend trying to find the best slow feeder dog bowl for your dog before he or she becomes overweight. A slow feeder bowl helps with portion control plus your dog should take longer over the meal so you won’t feel bad about them still being hungry. It’s only natural that if your dog finishes eating in a few seconds you’ll think they need more. When they take longer it’s more satisfying for you and your dog. What size is the best slow feeder dog bowl? Always make sure the slow feeder dog bowl you choose is large enough for your dog to access their food. If you have a smaller breed you’ll be fine with a smaller bowl. There are lots to choose from. If you have a larger breed you need to be very particular about getting a bowl with the obstructions far enough apart to let your dog get access to the food, but close enough together to slow them down when eating. If you’re buying a slow feeder dog bowl online check the recommendation for the size of dog the bowl is intended for. A larger dog cannot use a small slow feeder bowl. I have to admit I’m a huge fan of stainless steel. I use stainless steel bowls in my kitchen for preparing food and I like using stainless steel bowls for my pets too. If you’re looking for the best slow feeder dog bowl and you like stainless steel, you won’t be disappointed. 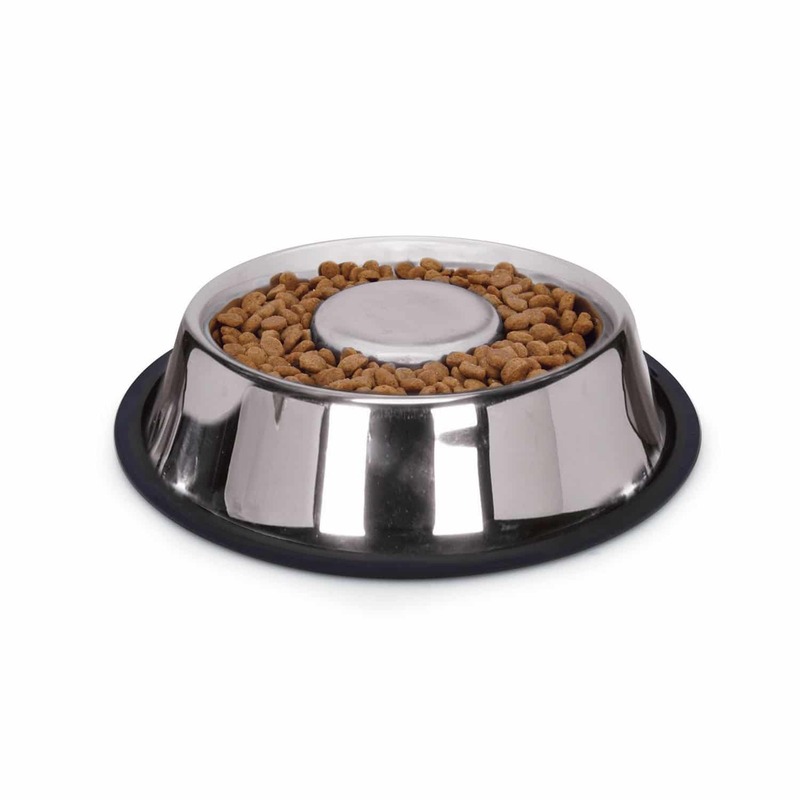 If you’re like me, you’ll love the stainless steel slow feeder dog bowls shown here. Here are 3 of the best available. ⇒ For a great price on this stainless steel bowl, click here. If you’re looking for a high quality stainless steel dog bowl, this slow feeder won’t disappoint. It comes in 3 different sizes. Small holds 3 cups dog food. Medium holds 5 cups. And the large size has an 8 cup capacity. Each size bowl is dishwasher safe for easy cleaning. 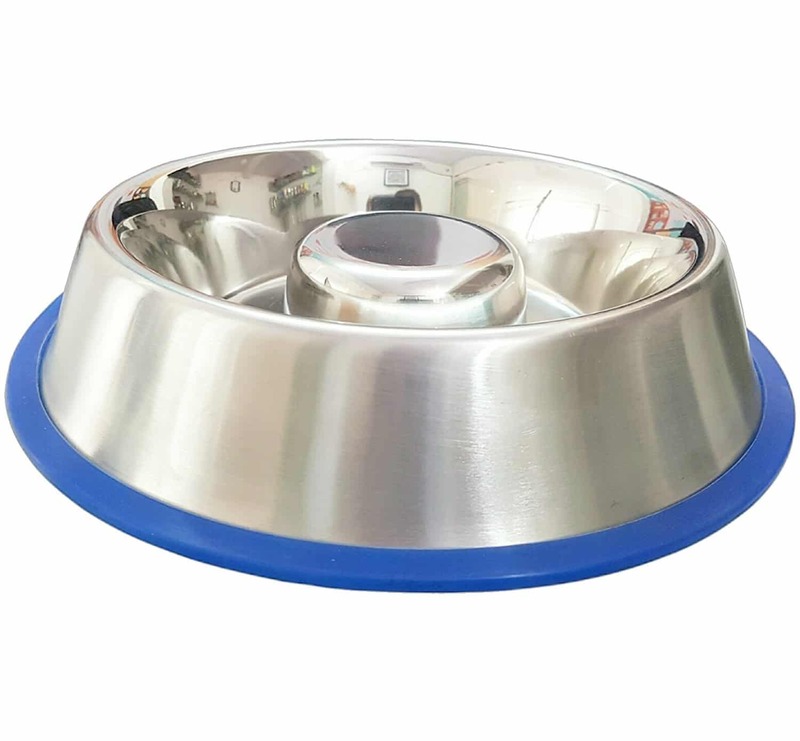 The bowl has a rubber bonded ring around the bottom of the stainless steel slow feeder bowl to stop skidding and noise when your dog is eating. This is a high quality bowl you can keep using for a long time. If you’re looking for the best slow feed dog bowl for longevity, you can’t beat stainless steel. If you’re looking for the best slow feeder dog bowl in stainless steel that’s very stable and less likely to topple over, this is a great choice. This bowl comes in 2 sizes. The medium holds 2 cups of dog food. The large takes 3.5 cups. I find the 3.5 cup capacity to be a really good size for a medium to large dog (not very large) so if you feed your dog about 2.5 or 3 cups per serving you’ll find this slow feeder dog bowl very convenient. This bowl is specially designed to include a silicone ring around the base to hold the bowl in place while your dog is eating. This product specifically uses silicone as a non-petrochemical material. The silicone ring is removable to ensure the bowl is washed thoroughly and there is no bacteria build-up from food getting stuck between the bowl and the non-slip base. Furthermore, this slow feed bowl is dishwasher safe for convenience. It is high quality and should keep you and your dog happy for a long time. ⇒ For a great price on this stainless steel slow feeder, click here. This is a high quality stainless steel bowl with a rubber base to keep it from slipping. The bowl is dishwasher safe when you remove the rubber ring from the bottom. This slow feeder comes in 3 different sizes – small, medium and large. Similar to the other bowls shown above, this bowl is also made from one piece of stainless steel. You will see some other bowls for sale that have screw-in bumps that have had problems with food and water getting stuck under the connection causing bacteria to grow. Obviously this is not desirable in a food bowl. 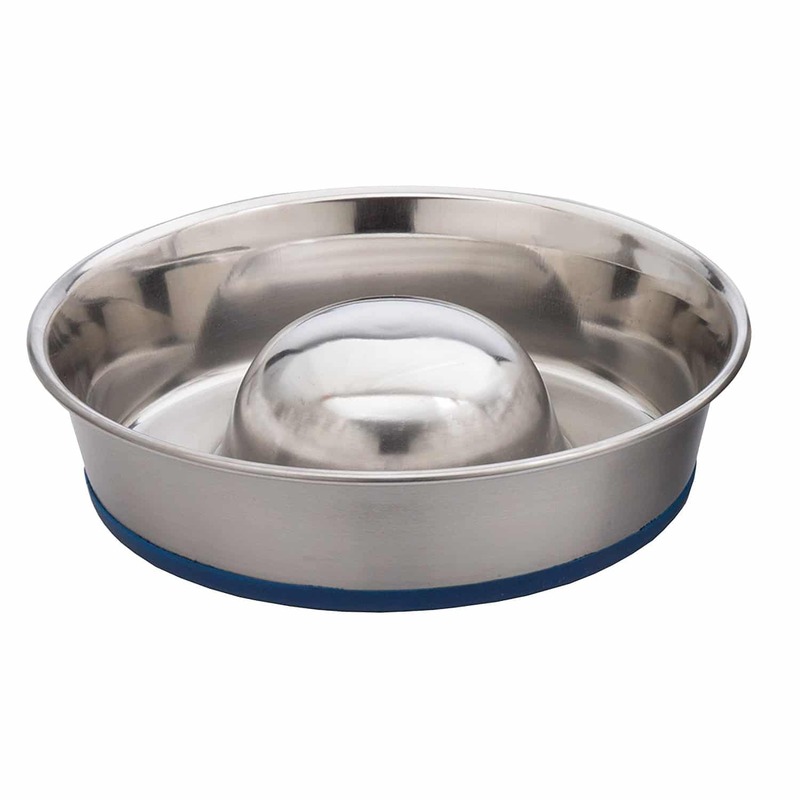 Each of these stainless steel bowls make the list for the best slow feeder dog bowl section in stainless steel because they are high quality and function well to slow down your dog’s eating. Not only do puzzle or maze slow feeder bowls slow down your dog’s eating habits, but they also provide mental stimulation. This is a good way to keep your dog’s mind occupied. If you have more than one puzzle bowl this is even better because they get variety and greater mental stimulation. ⇒ To see the price on this amazing puzzle bowl, click here. If you’re looking for the best slow feeder dog bowl to entertain your dog as well as slow down their eating then this is the bowl for you. With lots of fun obstructions, this is a maze for your dog to follow the food around. Furthermore, this bowl is such a cute shape. Another advantage is that it’ll look good wherever you put it in your house. It’s quite a talking piece! This slow feeder comes in small or large. It is recommended that the large be used for all dogs over 15 lbs. It has a rubberized base to stop the bowl moving around. As well as the non-slip base, this bowl has a low center of gravity making is harder to flip over or spill. 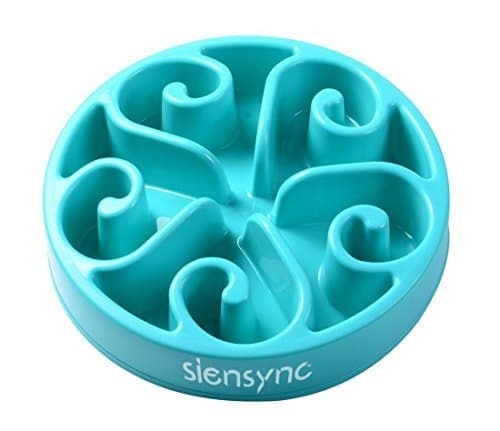 If you’re looking for a cute slow feeding bowl that will also engage your dog’s mind, this is a great choice. ⇒ For the latest price on this slow feeder, see here. 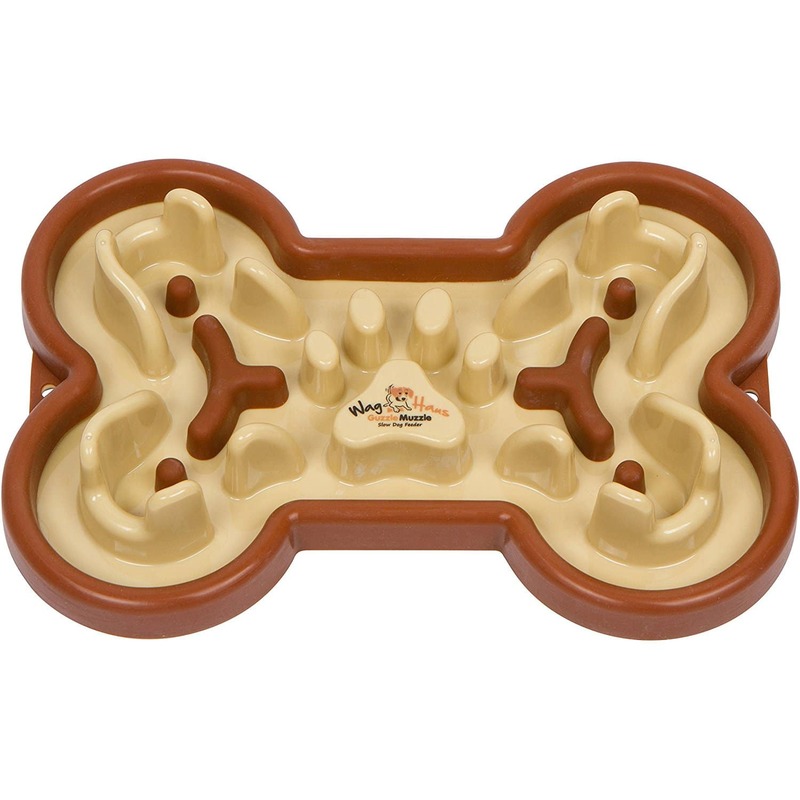 This maze slow feeder is very popular with small and large dogs. The design resembles blades of grass. Your dog will need to find their food among the tufts of “grass”. This feeder provides a mental challenge for your dog as well as slowing down their eating. It is fun to watch your dog using it and you can also put their treats on it and create a game. The feeder is dishwasher safe for easy cleaning. 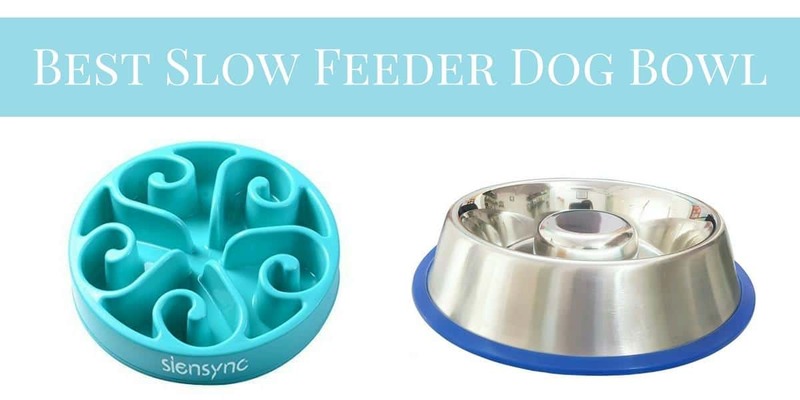 This maze slow feeder is more expensive than many of the other slow feeder bowls but if you read the reviews on this product, many dog parents say it is worth the money. Bloating is such a serious problem for dogs so, in my opinion, anything that can prevent this potentially fatal problem is probably worth it. Of course, if you’re on a really tight budget there are other options for choosing a slow feeder (see below). ⇒ To see a very good price on this maze slow feeder, click here. 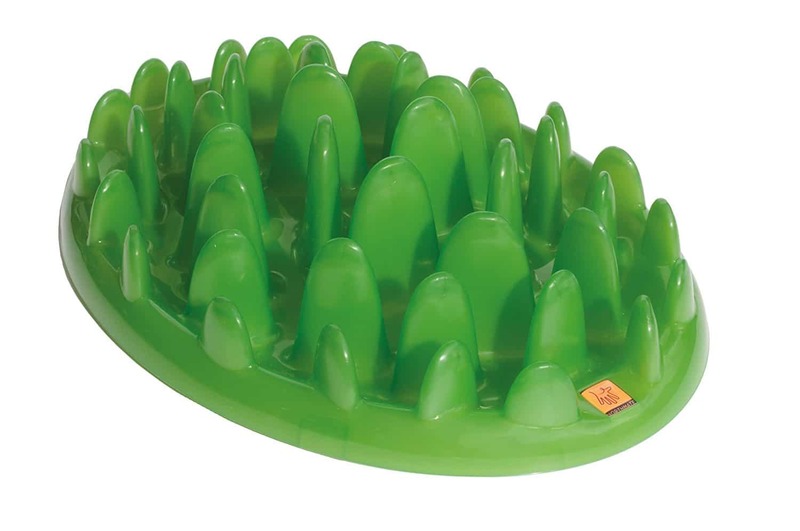 This maze dog bowl holds about 1.5 – 2 cups of food. This bowl is great for a medium size breed. If you have a small dog it may not be ideal. Also, for a large dog you would need to refill the bowl for your dog to get enough food. So, as mentioned, it’s great for medium dogs. There are plenty of other options for other sizes. 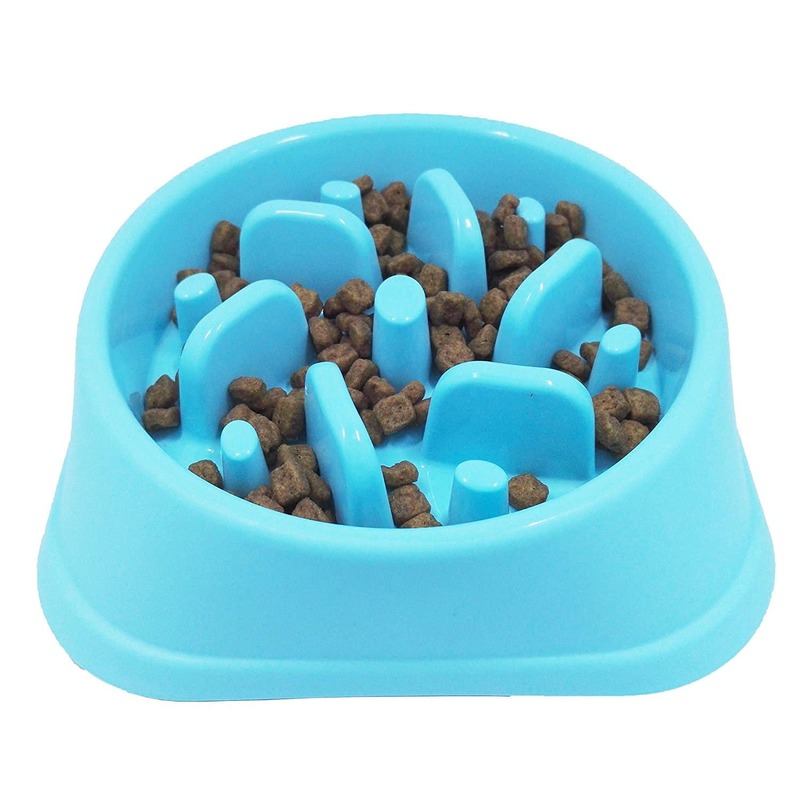 This maze slow feeder dog bowl provides mental stimulation for your dog while they’re eating. Naturally, it slows them down which is the main purpose, but you’ll also be happy seeing your pup engaged in a challenging activity. I’ve included 3 of the best spiral dog bowls under this category. All 3 are excellent products. This is one of the best and most popular spiral slow feeder dog bowls available. Rather like the others, it comes in two sizes, small and large, to suit most dogs. 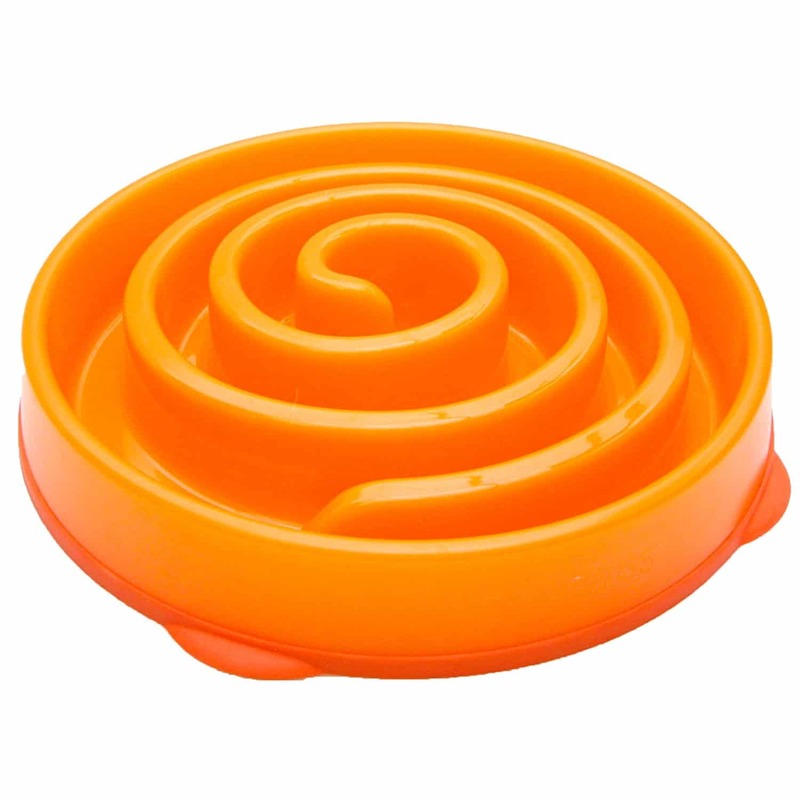 If you’re looking for the best slow feeder dog bowl in a spiral shape, this is it. It can be quite amusing to see your dog follow the spiral around as they’re eating. Consequently, this bowl is good at slowing down the eating process and you don’t end up with the bowl on the other side of the room. Quite a few dog parents choose to get more than one slow feeder bowl for their dog. This is because the different patterns in the bowl provide different challenges. This is good mental stimulation for your dog. It slows down the eating process by having multiple spirals. Obviously, your dog will have to work his or her way into each area of the bowl separately which definitely slows them down. This slow feeder holds 2 cups capacity. Even if it wasn’t good, I think I’d be tempted to buy it just for its color. I love it. Luckily it works really well so it’s worth buying for appearance and functionality. It definitely fits the bill for being in the best slow feeder dog bowl list. This slow feeder dog bowl is more about circles than spirals but for simplicity I’ve included it in the spiral bowl section. 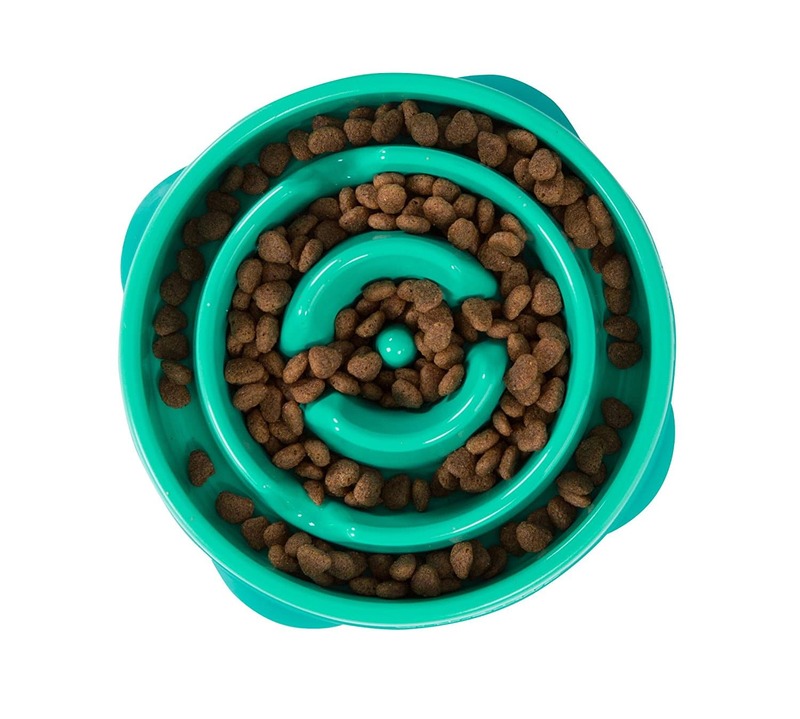 This is the best slow feeder dog bowl with circles! This one comes in two sizes. The small bowl holds 2 cups dry kibble. The large size holds 4 cups kibble. Of course, these bowls are not limited to dry food. You can use them for dry, wet or raw dog food diets. It can be washed by hand. In the alternative, it’s dishwasher safe (top shelf). Need a non-slip dog food bowl mat? Try this one and keep everything clean! If you’re looking for the best slow feeder dog bowl, you really can’t go wrong with any of the bowls shown above. These are all high quality products that will help your dog to slow down the eating and bring health benefits. This helps you (peace of mind) and your dog (better health). If you’re looking for a compartment type of slow feeder bowl then take a look at this tic-tac-toe bowl for dogs. It holds 40 ounces (about 5 cups) of food. It is too big to be used by very small breed dogs like chihuahuas but if your dog is medium to large you’ll love it. This tic-tac-toe design slows your dog down by making them eat from eat compartment separately. The edge of each compartment tends to make your dog return to the center of that section and finish it before moving to another section full of food. This helps your dog slow down their feeding and avoid air gulping. If you can avoid bloat you’re helping your dog’s health and providing peace of mind for yourself. This silicone pet food mat offers convenience. Avoids mess of food on your floor and stops the bowl from sliding. One small disadvantage of this bowl is that it tends to slide across hardwood floors or tiles. This is easily resolved by using a non-slip silicone pet food mat like the one shown here (see the image on the right). You can put this tic-tac-toe slow feeder dog bowl in the dishwasher or hand wash it. The plastic is BPA, PVC, and Phthalate free and it’s sturdy and good quality. It measures 9.84 W x 9.84 L x 2.28 H inches. This tic-tac-toe bowl is a great alternative to a spiral dog bowl. And if you have both designs you’ll keep it interesting for your dog by providing mental stimulation. ☑ Is your dog overweight? Want find the best low calorie natural treats? You probably already have them in your refrigerator! Click here to read more. I have 4 vacuums when it comes to dogs eating. I have read that plastic bowls are not the best. So stainless steel looks to be the best. I have 4 dachshunds that need a medium sized slow down bowl, do you have anything like that? Hey Sharon. If you have standard Dachshunds you’ll probably find this Stainless Steel Slow Feed Dog Bowl will suit your dogs, the link is here: https://amzn.to/2NtGtZI and you can order it online. Make sure you buy the medium size, not the large! The medium is 2 inches high which should be okay. But if you have miniature Dachshunds it’s hard to find a stainless steel slow feed bowl that’s small enough. You might want to try one of the plastic ones that is BPA-free. By the way, if you’re buying for 4 dogs, I’d just buy one bowl first to try the size and then purchase the same one again once you know it’s good for your dogs. I hope that helps.